I’m a big fan of the game Valiant Hearts, which was released by Ubisoft Montpelier last summer. It’s a game about WWI – but not an exclusively combat-oriented one. Based on my experience, Valiant Hearts falls under what Jim Gee calls “Big G” Games. “Big G” games are more than just software; they involve the social interactions and creative spaces that surround and extend from a game. Since this is a game and a content area (history) I care about, I thought I’d go through the list of qualities of “Big G” games and comment on the ones that stand out in VH. Collective Intelligence: The affinity space around the game includes social media communities and other resources. For example, players can explore more perspectives via Apocalypse 10 Lives, a companion to the game, which is an interactive animation that combines comic book art and documentary archives. Crowd Sourcing: parts of the game (for example, the artifacts used in the mini-game) were crowd sourced in development. Artwork and other creative expressions inspired by the game are shared via social media channels. Convergence: This game draws upon multiple media, including historical artifacts, photographs, and diary entries based on primary sources. Then of course it also includes the interaction of the game, and its visuals, accompanied by rather haunting music. Literacy: Historical details (terms, technologies, popular songs, games, etc.) that contextualize the experiences of the war are earned as the game progresses. Each informational detail is accompanied by a real WWI era photograph. Encouraging players to interact with evidence may introduce some players to the practices of “doing history” as well. Producers/Fabrication: There’s been quite an impressive wave of fan-created art and music videos inspired by the game. Preparation for future learning: There are a lot of really important, big ideas that can be taken away from VH – and since it’s a thoughtful game (and most likely appeals to thoughtful players), it seems likely to have a positive effect on preparation for learning. For example, the idea that war is more than combat, more than a real-life first person shooter. The history of a war is about more than just the brutality of the battlefield – this is emphasized by the game’s focus on the importance of non-combat roles and the many ways in which people can be pulled unwillingly into war. Art: This is a big aspect of the game. The way the world and its characters are rendered artistically, as well as the way they speak (somewhat in gibberish in actual dialogue, but also through letters, cut scenes, etc.) inspires a new way of visualizing or thinking about a complex and devastating war. In a sense, the game designers’ decision to render the game world, characters, and story in a more abstract way (vs. the more common gory realism prevalent in war-themed games) makes it more powerful, and encourages more nuanced interpretation. Cultural models: By providing multiple, intertwined narratives and different perspectives (including those representing marginalized characters), the game challenges the idea that there is one master or meta-narrative, one set of black and white “facts” that explains history fully. Identity: This game plays with identity by offering players the ability to play from more than one perspective. Players enter the game experience through the role of Emile, a French dairy farmer drafted to fight for his country. Then play transitions to the character of Karl, Emile’s son-in-law, who is conscripted into the German army and reluctantly leaves his wife Marie and their young son behind. As Anna, a Belgian student-turned-medic, players rescue wounded civilians and soldiers while searching for her lost father. Playing as Freddie, a Creole-American, players learn his backstory and motivation for voluntarily enlisting in the French Foreign Legion. The characters are linked by the war itself and also by Walt, one of the many mercy dogs dutifully serving on the battlefield. I should note that the game doesn’t do everything well; its linear narrative may limit replayability and player agency. The puzzles aren’t always tied to historical content in the most meaningful ways. But it would be difficult — if not impossible — for any one game to cover all of the “Big G” qualities Gee mentions. But VH pulls off a valiant effort (see what I did there?) with many of them, in addition to deeply engaging the player in an emotionally-rich narrative. In the next few months, I’ll be conducting qualitative research involving multiple-perspective play in Valiant Hearts, at which point I can share more insights about its affordances for learning. For now, I’ll continue to simply enjoy it. Gee, J.P. “Affinity Spaces.” Games for Change Festival. New York University. 20 June 2012. Keynote Address. Ubisoft (2014). 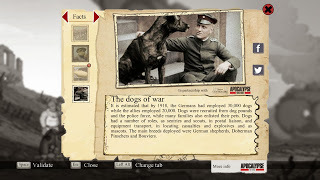 Valiant Hearts: The Great War [Videogame]. Montpellier: UbisoftGroup.